Has the name of a plant ever made you hesitate to try it? I’m convinced – with no empirical evidence, mind you – that the reason St. John’s wort isn’t as beloved in US gardens as, say, black-eye Susan is due to the name. St. John’s wort is the common name for Hypericum, a genus with almost 500 species worldwide, a few native to North America. The “St. John’s” part of the name is because some species flower around June 24, the feast day of St. John. “Wort” doesn’t mean anything to most of us, and sounds a lot like “wart,” evoking (to me, at least) an image of an ugly, weedy plant. Yet my assumption is wrong. It simply comes from the old English word for plant or herb. You’ll find it appended to the common names of a number of wonderful garden plants: spiderwort, barrenwort, and lungwort, for instance, all of which are more attractive than their names. It’s a shame the name is off-putting, because it’s a terrific plant that deserves to be better known. St. John’s wort is super easy to grow; you can almost plant it and forget about it. 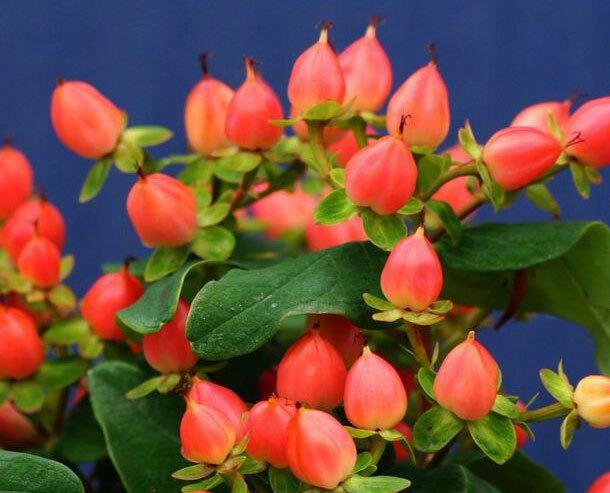 It offers two long seasons of interest, once when it’s in flower, and again when the fruits – the real reason to grow it – appear. St. John’s wort flowers in late spring. Most species have cheery yellow or gold petals with frothy pom pom-like stamens, and dark green leaves. The hips (also referred to as berries) start appearing in late summer and continue through fall. It’s the hips that can be different colors. Originally a deep burgundy or cocoa color, they’ve been hybridized so that now cultivars fruit in yellow, cream, coral, pink, green, or cherry red. Moist, well-drained soil. Also does well in sandy soil in full sun. 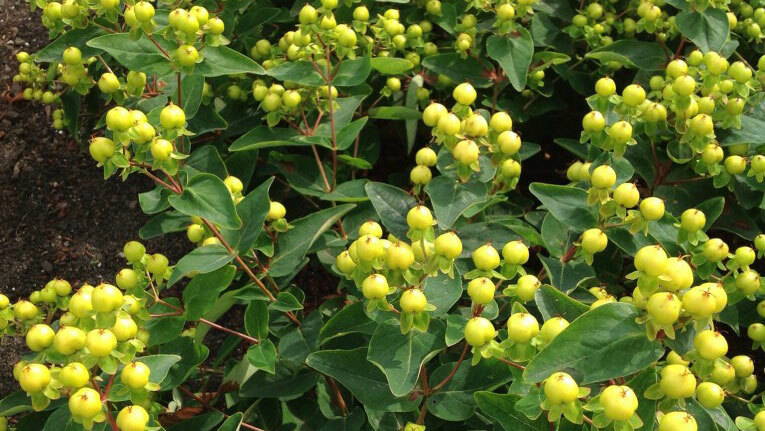 St. John’s wort is often sold by florists in fall bouquets, so while you may not be familiar with the plant in the garden, you may well have received flowers containing a stem of these clustered, cherry-like fruits, and not known what it was. A shrubby perennial, St. John’s wort is good in a mixed border or at the feet of a more leggy plant. It will die back to the ground in colder zones in the winter, but in warmer climates it is evergreen. Where it is evergreen, shear plants every few years to reinvigorate them. 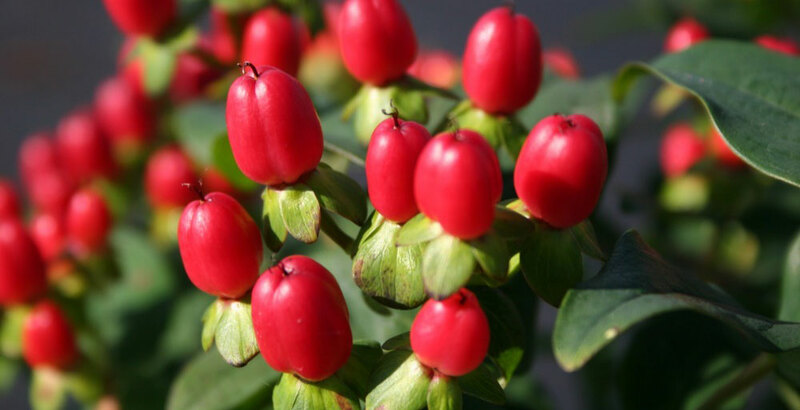 Magical Pumpkin, Magical Lemon, and Red Flare are three great Hypericums for American gardens. If you can’t find any of them through mail order or at your garden center, try different ones. You won’t be disappointed.